This tour will take you to the mysterious and attractive historical Silk Road - one of the most worth visiting places in the world. Tourists will also visit the westernmost city in China and also one of the key city on the Silk Road - Kashgar, to enjoy its Uighur atmosphere and snow mountains, glacier lake around it. The Silk Road passes through Shaanxi, Gansu, Qinghai Provinces, Ningxia Hui and Xinjiang Uygur Autonomous Regions in China and then stretches over the Pamirs, further extend to Central and West Asia and finally gets to the east bank of the Mediterranean Sea and Eastern Europe. The total length of the Silk Road is over 7000km, over half of which is in China. There are numerous scenic spots and historical sites along the silk road: Jiayuguan Pass, the Mogao Grottoes of Dunhuang, Yangguan Pass, the Turpan Basin, Bazaar of Urumqi, Abakh Khoja Tomb, Idgar Mosque, Kashgar Old Town of Kashgar (Kashi) and many more. In this remote area, tourists can find many interesting and unique issues – includes Mogao Grottoes – the world-famous art treasury with invaluable murals and sculptures made between the 4th and the 14th centuries. The Etigal Mosque (Id Kah Mosque), Bazaar, Afaq Khoja Tomb, the Old Town of Kashgar, Karakuli Lake, Gongeer Peaks, Mount Muztagata. * Visit the largest and richest Buddhist treasure trove in the world - the Mogao Grottoes which is with invaluable murals and sculptures made between the 4th and the 14th centuries. have been in use for the longest time in the world. * To know the real life of Uighur Minorities in China. * Visit the westernmost city in China, the most famous oasis in desert - Kashgar, to enjoy its old streets (UNESCO World Heritage) and the "the Father of Glaciers" – Muztagata Mountains and charming glacial lake near it! * Enjoy the stunning scenery on the Heavenly Lake on top of the Mt. Tianshan (Heaven Mountain). * Step onto the west end of Great Wall – Jiayuguan Pass. Your private driver and guide will be ready for you at the airport or railway station when you arrive in Jiayuguan City. Sit back in a comfortable, non-smoking car, leave the hassles to your guide, and enjoy a trouble-free transfer to your hotel in central Jiayuguan City. After breakfast, your guide and driver will take you to visit the West Terminal of the Great Wall, Jiayuguan Pass. Then drive west for for around 380km/4 hours to Dunhuang. Today in Dunhuang, you will visit: Mogao Grottos (UNESCO World Heritage), Crescent Lake and Echo Sand Hill. Afterwards, transfer service for around 130km/2h to the Liuyuan Railway Station to take the overnight train to Turpan. Mogao Grottos: Constructed over a millennium, from the 4th to the 14th centuries, the caves hold the worlds richest treasure houses of Buddhist sutras, murals and sculptures. There are about 30 caves open to the public, but usually the tour consists of 5 which provide a representation of the total. The selection is at the discretion of the guide. The Singing Sand Mountains and Crescent Lake: Crescent Lake is in the Singing Sand Mountains, 6 km south of Dunhuang. It is an oasis in the desert. The lakes name derives from the crescent-shaped lake formed by the spring water between two huge sand dunes. Although the area is very dry, the pool doesnt dry up as one might expect. Arrive in Turpan in the morning. 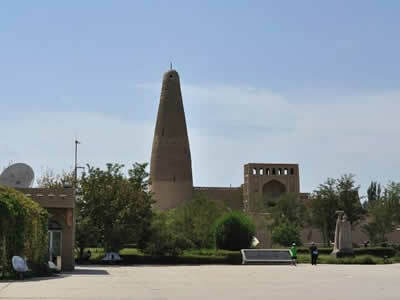 Tour in Turpan to visit: Flaming Mountain, Suleiman Minaret (also known as Sugong Tower or Emin Minaret), Karez Well, Grape Valley, Jiaohe Ancient City Ruin and Uighur Village. Afterwards drive for around 200 km / 2.5hto Urumuqi. On the way, you will pass the biggest Wind Power Base in Asia, Dabanchen Wind Power Plant and the Dead Sea in China, Salt Lake. Suleiman Minaret: Also known as Sugong Tower or Emin Minaret, it is the biggest ancient tower existing in Xinjiang and the only ancient Islamic minaret in the country. It is located 2 km southeast of Turpans center. The Karez Wells: This irrigation system of wells connected by underground channels is considered to be one of the three great ancient projects in China. The Karez Wells Folk Garden and Museum is located adjacent to Turpan, 3 km west of the city center. The famous fruit and vineyards of these hot, dry desert communities owe their existence to the Karez wells, ancient underground irrigation channels fed by wells that tap into the snowmelt from surrounding mountains. These systems are still maintained and functioning today. A small museum provides an insight into their intriguing history and construction, and takes you below ground for a first-hand view. The Ruins of the Ancient City of Jiaohe: As the worlds biggest, oldest and best preserved adobe building city, and the most complete ancient urban site, Jiaohe was built by the ancient Cheshi people in the Qin dynasty (221–206 BC) and the Han Dynasty (206 BC–220 AD). The highest military and political institution in the Western Regions of Tang Dynasty is also in this city. 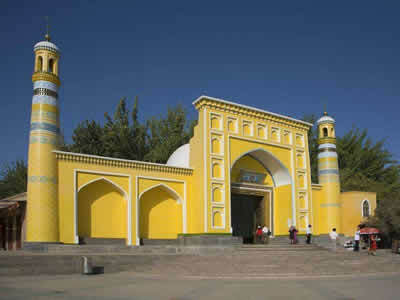 Located in the Yarnaz Valley, 10 km west of Turpan, it was dug out of and constructed from the yellow-gray parched ground of a narrow 30-meter-high, 1.5-km-long vertical sided island in a river. It is a good vantage point for seeing the surrounding landscape of vineyards and orchards followed by desert and mountains. In the morning, drive for around 2.5 hours to the Heavenly Lake, a lake on top of Mt. Tianshan (Heavenly Mountain, the UNESCO World Heritage). Taking boat to cruise in the lake. The blue lake water is finely contrasted with steep forested hills, high meadows and snowy Heavenly Mountain peaks behind. There you can walk, take electric carts, cable cars and a boat cruise on the lake. Afterwards drive back to Urumuqi. If time permits, you will also visit the Erdaoqiao Grand Bazaar in Urumuqi. Transfer service to Urumuqi Airport and say goodbye to your guide in Urumuqi. Fly from Urumuqi to Kashgar by the early night flight. Your local guide and driver will meet you at Kashgar Airport and transfer service to your hotel in Kashgar. Today in Kashgar, you will visit the oldest, biggest, most important Mosque in China - The Etigal Mosque (Id Kah Mosque), the biggest Bazaar in the middle Asia, Afaq Khoja Tomb. Afterwards get to the Old Town of Kashgar, UNESCO Site, to stroll and enjoy this famed charming old town. The Etigal Mosque (Id Kah Mosque): This 15th century mosque is one of the largest and busiest in China. At midday on Fridays around 10,000 people will gather to pray and study the Koran, and prayer 5 times/day on other days. Youll be asked to remove your shoes before entering the Main Hall, which has traditional Islamic pillars, carvings and rugs strewn over the floors. Women are advised to cover upper arms and legs, a scarf is not compulsory, but is seen as a mark of respect. This is a must visit place for tourist in Kashgar. 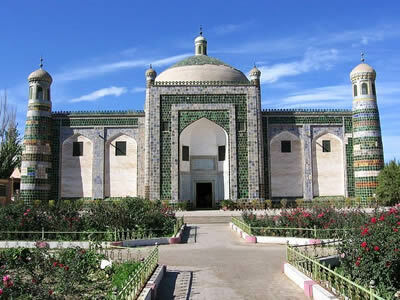 Afaq Khoja Tomb: The tomb served as the family tomb of Abaq Khoja, the powerful ruler of Kashgar in the 17th century who was revered as a prophet and second only to Mohammed. Sunday Bazaar (now opened everyday): The famous Sunday bazaar has been operating since ancient times, and the scale has become larger and larger, attracting merchants from all over Xinjiang and neighboring countries such as Pakistan and Kirghizstan. Farmers from the suburbs of Kashi come to the bazaar early in the morning, using various means of transportation, such as bicycles, motorcycles, tractors, trucks and donkey-drawn carts. The highways leading to Kashi are crowded with these vehicles and pedestrians on Sunday mornings, as well as with flocks of sheep. Today you will drive along Sino- Pakistan Highway for around 190km/4 hours to the famous plateau lake near Pakistan, Karakuli Lake. On the way, you can enjoy the 7719m high Gongeer Peaks and 7546m high Mount Muztagata which is with the name of "the Father of Glacier". Then return back to Kashgar. Lake Karakuli, The lake is in Kashgar, about 1500 km from Urumqi in southwest Xinjiang, and about 3600 m above sea level. Mount Muztagata (said to be one of the five most beautiful mountains in the world) provides a beautiful backdrop at 7546 meters with the nearby Gongeer Peaks rising to 7719 meters above sea level. Transfer service to the airport in Kashgar. Your guide will look after you until your safety at the correct airport check-in desk to complete your amazing tour. Say goodbye to your guide and the Silk Road.